My experience while taking Sil was very interesting. On the first day, I didn't want to do Sil, because I thought it would be boring. Soon as I took the ten precepts, it changed. 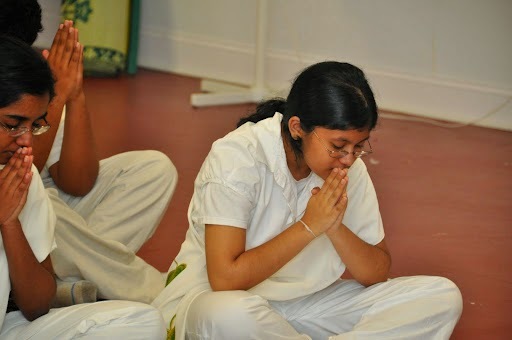 During Bhavana, it was really hard to concentrate on breathing. Also I had difficulties on sitting in one position. I kept moving posture which was very uncomfortable. After Bhavana, Venerable Wajirabuddi asked two people to prepare the Puja, which was Iedisha and I. We took the tray of food, put a cloth over it, went to the shrine room and started chanting. Then during breakfast the sil members and I had to focus on eating and tasting the food, which means eating mindfully. We also did loving friendliness meditation. I thought about all the people, creatures, problems, and troubles they are going through. I felt deep sympathy and compassion about everybody. During walking meditation, I had to walk slowly and focus on the walking mechanism. Sometimes it was hard to balance since the movement was so slow. Around 6:00 P.M we went to a Vietnamese temple. I really enjoyed the trip to the Vietnamese temple. There were beautiful stones and structures inside the Vietnamese temple. Later on the Sil members and I had to prepare for Puja. It was nice preparing for the Puja. I felt peaceful . I liked working hard instead of being lazy. Then we started paying respect and chanting for the 28 Buddhas. Our bedtime was at 9:00 P.M. We had to sleep early because we have to wake up at 5:00 in the morning. At 5:30 A.M, we did Bhavana. Again I had difficulties focusing on one object, and my whole body was in pain. We did walking meditation. It helped me focus on walking slowly. Then Ven. Vajirabuddi Thero taught us Dhamma. He even taught us a Suttra that has five powers and one of them that I remember is shame. If you have shame that means you care about your actions. If you don't have shame it means you don't care or fear the consequences. We didn't get a chance to go visit a temple. Instead Uncle Deeptha came and taught us Abhidhamma. I got to learn what happens in the past, present, and the next life. I even learned that the mind is in the heart and not in the brain. In Abhidhamma, I learned some things I didn't know about Buddhism. After Abhidhamma, we did puja and went to bed. We were happy and exhausted. Even though it was hard sleeping on the floor, we fell a sleep fast. My experience on this day was quite successful because I learned many things I didn't know. This was our last day. This time I've gotten my mind to concentrate on breathing and sitting in one position. When pain came, I concentrated on pain. I thought it was quite successful. During our last day we got a chance to go to aCambodianTemplewith Ven. Vajiraboddi Thero. In the Cambodian temple there were beautiful sculptures and it felt spiritual. It fascinated me. After visiting theCambodianTemple, we came to theTempleand did Abhidhamma with Uncle Deeptha. He told us about Buddhism and the philosophy of it which was interesting. Then we prepared the Puja. I finally finished Dhasasil by taking the five precepts. Taking Sil for three days was actually beneficial. It helped me quite a lot. It opened my eyes a bit on seeing the true reality. Learning dhamma helped me fix some of my mistakes. I wish I can take Dhasasil again next year. I want to thank Ven. Wajirabuddi , Ven. Wajiraboddi and Uncle Deeptha for giving us this wonderful opportunity to learn Buddhism.